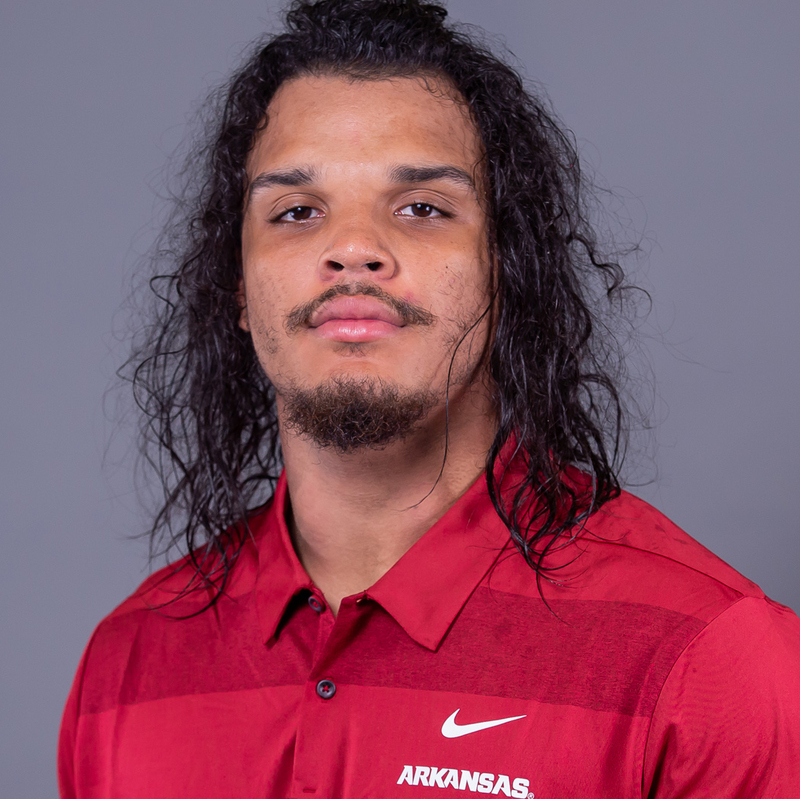 2018 (SENIOR): Played in each of the first five games of the season for the Razorbacks in his final season on the Hill, starting at the tight end spot against North Texas on Sept. 15 … Totaled 183 offensive snaps, according to Pro Football Focus, with a season high of 51 coming against the Mean Green … Caught five passes for 45 yards, averaging nine yards per reception … Opened the year with a catch for two yards against Eastern Illinois (Sept. 1) … Followed it up with a season-best two receptions for 26 yards, posting his season-long play of 19 yards coming in the second quarter against Colorado State, setting up Arkansas’ third score of the game … Had a catch in each of the next two games, one for 11 yards against North Texas (Sept. 15) and the other for six yards at Auburn (Sept. 22) … Posted his best PFF grades of the year against the Rams in Fort Collins, putting together an overall offensive mark of 84.5, with a breakdown of 77.0 in run blocking, 75.9 in receptions and a 72.4 mark in pass protection … Helped the Razorbacks be one of four SEC teams to complete passes to four different tight ends in 2018 … Part of a receiving corps that put up 2,307 yards through the air and 17 touchdowns. 2017 (JUNIOR): Developed into a starter at tight end … Played in 11 games with six starts … Started against South Carolina, Auburn, Ole Miss, Coastal Carolina, LSU and Mississippi State … Caught 11 passes for 189 yards, which led all tight ends on the team, for a 17.2 per-catch average … Longest reception was 33 yards … In the final four games, had nine receptions for 136 yards, including a catch of 25 or more yards in three of those contests … Had a 20-plus yard grab in five games … Converted eight receptions into first downs … vs. No. 23 TCU (Sept. 9): Recorded his first catch as a Razorback for 33 yards and first down … vs. Coastal Carolina (Nov. 4): Turned three catches into 49 yards, highlighted by a 31-yard grab … at LSU (Nov. 11): Led the team in receptions (4) and had 44 receiving yards, including a 27-yard catch … vs. Missouri (Nov. 24): Closed the year with a 33-yard reception. 2016 (SOPHOMORE) AND 2015 (FRESHMAN) AT ARIZONA WESTERN CC: Consensus four-star prospect and the No. 1 tight end according to ESPN, Scout and 247Sports … Ranked the No. 9 junior college prospect by 247Sports, marking the first time since 2013 a tight end has been in the top 10 … Tabbed the No. 17 junior college player by Scout and landed at No. 33 in the ESPN JC50 … Helped lead Arizona Western College to the NJCAA championship game, a record of 11-1 and the No. 3 ranking in the final NJCAA poll … Coached by Tom Minnick … Named the team’s offensive MVP at the El Toro Bowl after scoring a fourth quarter touchdown … All-WSFL and All-Region 1 honoree … Totaled 18 receptions for 242 yards and a team-best six touchdowns … Hauled in five TD grabs over his final three games … Had a team-high four TD receptions to go along with 17 catches for 316 yards as a freshman in 2015 … Chose Arkansas over Alabama, Auburn, Louisville, USC, Utah, Mississippi State, South Carolina, Oklahoma State, Nebraska, Pittsburgh, Houston, Arizona State, Arizona and others. PERSONAL: Born on Sept. 9, 1996 … Son of Michelle Spangler and Mark Patton … Has three siblings: Mark Patton Jr., Mariah Patton and Shawn Adams … Communication major.